My name's Naomi(not Kris, that's my mom), and I enjoy great photography...which is why I enjoy this site. I'm an amatuer, but I do enjoy photography a lot myself. You guys have a lot of talent, which is inspiring. ANd if I ever do comment again, I'll probably ask a question about how, which I should probably already know. So.. any advice for a photographer who's learning? I think some important advice is to experiment, take pictures wherever you go and take pictures every day if you can. I know that taking pictures every day (or almost every day ;]) has really helped improve my photography. Plus I always have that deadline of 11:59 pm to come up with something. Sometimes I do rush but I also have to try to take my time a little and try and come up with something worth looking at. It makes me stop and look around me a little harder to see the photographic possibilities that we're all surrounded by. I am definitely digging the colors. Did you add the vignette or was that because of your lighting? Which leads to my next question, how did you light it? 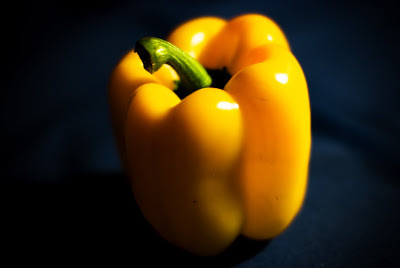 While I enjoy your short depth of field, I can't help but wonder if having the whole pepper being sharp would add something to it. Maybe bumping your aperture up to 2.8 or something? Did you take any pictures like that? I'm glad you enjoy our blog! And I can't say any of us are professionals; we're all amateurs here too. :) (Check out wearemjr.com for real pros. They're my inspiration.) I'd say what Emily said, but she already said it. Just practice yo. I'd also advise you to go easy on photoshop. I'm struggling with this myself; sometimes it's easy to go over the top, but more and more I'm discovering I like natural look better.